There are 25 shells on the face of this penny! Like many people, one of my favorite pastimes is collecting seashells. However, my collection differs from most. 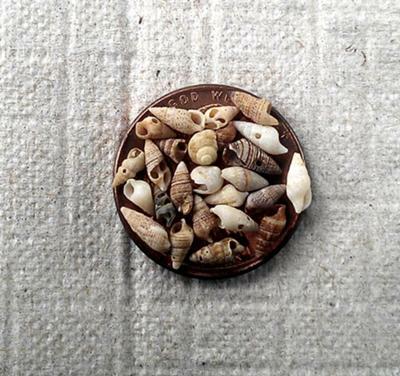 I collect micromollusks - miniature seashells. What most people don't realize is that some of those "grains of sand" you have been walking on are actually tiny seashells. 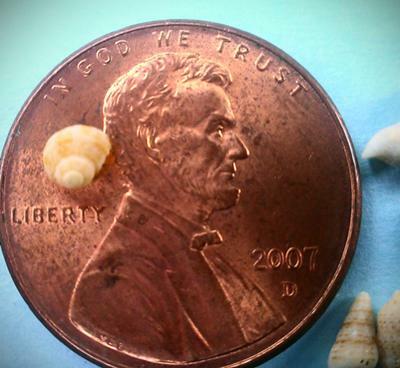 I started collecting miniature seashells over 30 years ago after I found my first tiny shells on a beach in San Diego. They are harder to find, of course, but very worth the effort. Especially when you find a perfectly formed seashell, so small they can fit on the head of a pin! I have a little glass bottle to keep them in that has a magnifying glass on the top. Just like with larger shells, you have to continually look for these. There are two beaches on the central coast where I have found a large number of shells in a variety of shapes and colors. Montana de Oro beach past Los Osos and Lover's Cove in Pacific Grove both have the miniature variety. As well as my tiny bottle to display them in, I am currently making jewelry with the shells cast in resin. I have also made crafts for dollhouses using these shells. There are so many possibilities for unique craft and gift items. I hope you enjoy your miniature shell searching adventures as much as I do! How do you clean these tiny shells when you get them home? "I have a little glass bottle to keep them in that has a magnifying glass on the top." Hi, I just broke my little bottle as you describe, & I have no idea where to find another! I saved all my little shells! Hi! I loved hearing about how you collect mini shells! I have been a collector of baby shells for a long time myself. 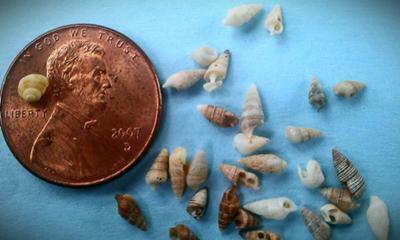 Some of those baby shells are accually full grown, and are just very small. My favorite tiny hell is the winthletrop , very beautiful. Not only babies, but I also love all San Diego shells and have a nice collection. Last Christmas my falmily all recieved gifts I made with my seashells. I'm excited to saty that after a very long dry run, I am finally finding lots of sanddollars here in north county.